Butter and a small amount of sugar accentuate the natural sweetness of these carrots. This easy recipe will make everyone happy! Carrots are one of those vegetables that kids often try to avoid. This version is a bit sweeter, so it might appeal to those picky eaters. Attractive rainbow carrots are an excellent option as well, and the novelty of the different colors might tempt kids enough to give them a try. Also, white or yellow carrots are milder in flavor and somewhat sweeter than orange carrots and other colors. This dish calls for sliced carrots, but baby carrots are another option. Or cut the carrots into small—1/4-inch to 1/2-inch—dice or matchsticks. For extra-fancy carrots, purchase a "wavy knife" and make crinkle-cut carrot slices. Carrots are high in vitamin A and low in calories. One medium carrot (61g) contains only 25 calories. However, the natural sugar content makes them higher in carbs than many vegetables. If you're on a low carb diet, you might want to avoid carrots or eat them in moderation. Scrub the carrots and peel them. Cut off and discard the stem end. Slice the carrots thinly on the diagonal. Put the sliced carrots in a medium saucepan. Add the water, salt, and granulated sugar. Reduce the heat to medium-low, cover the pan, and cook for about 20 minutes, or until the carrots are tender. Drain the carrots and toss with 2 tablespoons butter and chopped parsley, if desired. To make matchstick carrots, remove a thin slice (lengthwise) from one side of a carrot. Place the carrot on the cutting board its flat side, so it won't roll as you cut. Cut the carrot lengthwise into 1/4-inch slices. Stack a few slices on top of each other and slice them lengthwise into 1/4-inch strips. Cut the strips crosswise into 2-inch or 3-inch lengths, as desired. Or cut the strips into 1/4-inch lengths for diced carrots. Baby-cut carrots are convenient for cooking and snacking because there's no need to peel them. Baby-cut carrots are, essentially, larger carrots which have been cut down to the smaller size. They also might be treated with chlorine during the processing. 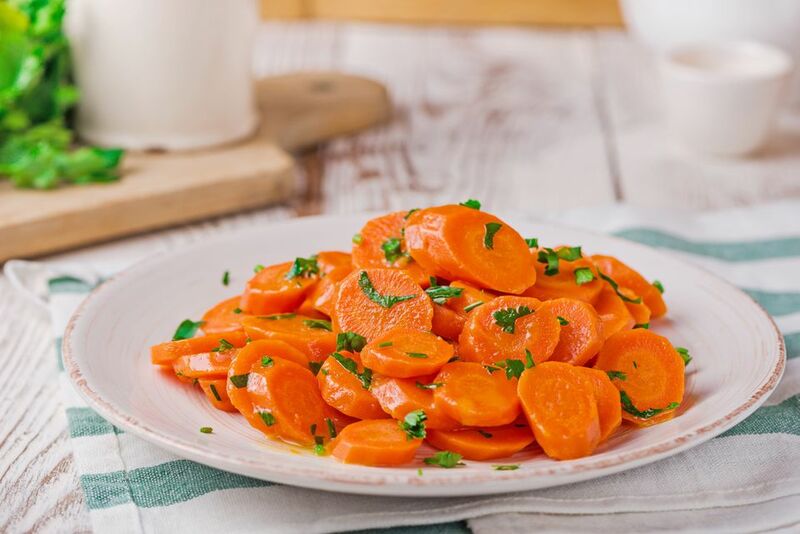 For the freshest and healthiest choice, use fresh unpeeled carrots for snacking and in recipes. For additional flavor, replace the granulated sugar with brown sugar, maple syrup, or honey. Garnish the carrots with some chopped fresh parsley, chives, or cilantro. For sweeter glazed carrots, take a look at these honey-glazed carrots or these crock pot orange glazed carrots.